GCC chemical industry has huge economic significance and is increasingly becoming customer focused, competitive and dynamic. The chemical industry is experiencing M&A activities and thus emerging giants of the industry who are changing the competitive landscape and ruling out the small industry players. The chemical industry is sustaining on the lines of innovation in technology, volume and productivity and also keeping up with the global standards. GCC chemical industry witnessed fluctuations in the year 2016 due to declining oil prices to nearly 60% since 2013, with USD 77 billion sales revenue in 2016 dropped at a rate of 3% year-on-year. Chemical industry is oldest in the GCC region and also is the building block of various other industries majorly the manufacturing industry. By region, Saudi Arabia chemical industry recorded highest growth rate by 12.7% followed by Kuwait, Qatar and Oman. The macro-economic indicators have been under instability due the declining oil prices since past 5 years, causing slow economic growth and government finances. Nearly 79% finance for the regional government is generated from the oil industry. In order to sustain the job creation in the industry, it has to grow nearly 9% from the past decade. Chemical industry contributes 3% of the GCC gross domestic product (GDP). In the past five years, 2016 had shown growth highest figures, reaching 158.8 million tons thus, showing the rising trend in the chemical industry estimated to grow by 3% in 2017. GCC combined chemical production capacity is increasing but the individual results of Saudi Arabia, UAE and Oman were above the GCC average trend. UAE and Oman has outpaced the GCC average, Saudi Arabia being near to the average, Qatar and Kuwait below the average and Bahrain performed much lower than the average and shows near constant capacity since 2007. In terms the market share of the production capacity in 2016, Saudi Arabia acquired 67%, Qatar (12%), UAE (8%), Oman (6%), Kuwait (6%) and Bahrain (1%). The GCC chemical industry is loaded with feedstock, with different type and volume of feedstock available impacting the capacity and product portfolio expansion. The GCC chemical industry produced 102 chemical products in 2016 with the value addition of 10 chemical products since 2014. Chemical industry has largest contribution to the manufacturing industry contributing a value addition of 28%. Oman and Qatar provides highest figures of 51% and 44% respectively of the total value addition from chemical industry to manufacturing. Whereas, Saudi Arabia chemical industry contributes nearly 27% to manufacturing industry in 2016, up by 3% since 2010. Basic Chemicals acquired largest production share of 35.3% in 2016, followed by fertilizer chemicals (23.8%), polymers (18.7%) and intermediaries (18.6%). Basic chemicals, intermediates and polymers together are the major components of organic petrochemicals that accounts for major activity in GCC region gaining a share of 73%. The rising demand for chemicals in fertilizer industry is boosting the growth of inorganic chemicals industry. Major chemicals demanded are ammonia and chlorine. Fertilizers are important segment of application of inorganic chemicals representing 92% of the entire production, thus driving the capacity expansion of the chemicals industry. Further, GCC chemical industry capacity utilization declined since the global financial crisis. In 2015, capacity utilization had reached to lowest level i.e. 90%. Global capacity utilization fell by 79.6% whereas GCC utilization was 89.8%. Still the capacity utilization is below the average it was during pre-crisis levels. But the reduced figures can be attributed to increasing unity cost per ton of chemical product. 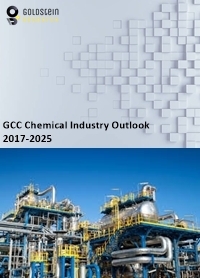 The report covers the present ground scenario and the future growth prospects of the GCC Chemical Industry for 2017-2025 along with the market players’ analysis. We calculated the market size and revenue share on the basis of revenue generated from major players in the GCC region. GCC Chemical Industry Outlook 2017-2025, has been prepared based on an in-depth market analysis from market experts of chemical industry in GCC region. The report covers the competitive landscape and current position of major players in the GCC chemical industry space. The report also includes porter’s five force model, SWOT analysis, company profiling, business strategies of market players and their business models. “GCC Chemical Industry Report” also recognizes value chain analysis to understand the cost differentiation, pricing models to provide competitive advantage to the existing and new entry players.